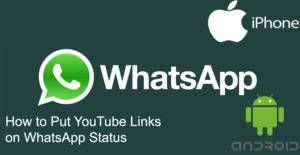 Sharing YouTube links on WhatsApp status is quite popular nowadays. If you would like to do that on your iOS or Android device, you will find step by step guideline on this page. You can also share this links with stylish fonts with our tips on How to Chat Online. Actually you don’t need to do much for sharing them. That will take your only a few seconds and you will able to give your message with YouTube songs. Let’s begin to tell you how to do that. You can do these tips for both Android and iOS devices, so we won’t tell it on separate headers or pages. You can watch our guideline video below but if you don’t want to watch video and see the text steps please swipe/scroll down. Tap on “Share” which is located just below video. You will see the link of the video. Copy the link of video. Run WhatsApp Messenger on your iOS or Android device. Go to Status text area. If you don’t know how to write status, please click here to learn for Android, click here to learn for iOS. Paste link on the text area. Tap on arrow button and publish Youtube link on WhatsApp Status. That’s all you have to do for sharing a link on your status. If you would like to ask any questions, please let us know with commenting this page. We are going to tell you how to share Youtube Videos at our incoming pages too.